Apple may pride itself over iOS - a very well optimized operating system - but its weighty animations can sure use a speed-up! Especially if you're still sporting the good old iPhone 4S or an iPad 2 - both pretty nice devices you can score for cheap nowadays. Thankfully, rogue iOS developers are no less productive than their Android counterparts over at the XDA board, pumping a truckload of tweaks inside the Cydia store on a daily basis! 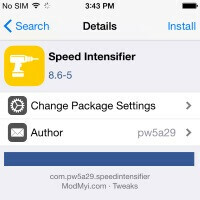 One that caught our eye is Speed Intensifier, a jailbreak app which lets you tweak iOS 6, 7, and 8's animations until you get the best ratio of speed and smoothness... or just disable everything and watch your iDevice breeze through stiff, disciplined menus. We'll show you how it works - just get your device jailbroken before you proceed. Fire up Cydia and tap the search icon. Look up Speed Intensifier, and tap on it when it shows up in the list. Notice the awesome power drill icon - for no particular reason, other than it's awesomeness! Go ahead and tap 'Install', then hit 'Restart SpringBoard' when installation finishes. Now that you installed it, you may close Cydia and immediately think to yourself "Whoah, my iPhone just got all juiced up!" Well, hold your horses, because the app isn't even activated yet! You're simply enjoying the benefit of re-springing an iDevice every now and then. So, how to get Speed Intensifier working? Open 'Settings' and scroll down all the way to the 'Speed Intensifier' menu. We've got some work to do here! Tap the switch to enable Speed Intensifier. Then, tap the 'Advanced' button. By switching to Advanced mode, you enable whole system speed-up. Simple mode only speeds up iOS's stock animations. Next, have a look at the General Animations menu. It lets you adjust the animation transition scale. The leftmost option basically disables animation transitions, shaving some load off the processor and graphics unit. This means animations will look a little rough, but your iDevice - especially if its an older one - will get a much welcome speed boost. If you'd like a hint of smoothness, experiment with bigger animation scaling settings. Next up is the Spring Animations menu. If you want the lightest animations, set the Mass slider to the lowest value. And for the others, try settings Stifness around 1.1 and Damping to around 1.3 - and see how this goes. When you're done tweaking, re-spring the device (not necessary, but just in case), and enjoy your speedy animations! Those animations are the speed they are for a reason - to cover up the application load time. Speed them up, and see the lag. I wish there was a way you can just access developer options and check the speed you want. Oh well, suppose we just live in an innovative world.